Mix together cream cheese, onion and Mrs. Dash Spicy Sauce. Spread evenly on pastrami slices. 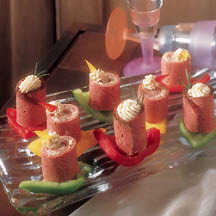 Roll pastrami and slice into wheels. Place wheels on pepper chunks, refrigerate until ready to serve. Garnish with rosemary sprig if desired. Serve cold. Nutritional Information Per Serving (1/20 of recipe): Calories: 84; Total Fat: 6g; Saturated Fat: 3g; Cholesterol: 22mg; Total Carbs: 4g; Fiber: 1g; Protein: 5g; Sodium: 173mg.